400+ Free Tally resumes to do accounting Job for you. Ever since the starting of Tally Job service for Tally users across the glob, ApniTally has collected more then 400 resumes of people from different parts of India. These resumes have been submitted by people who are interested in doing job in Tally. The job resumes are from across the India and from almost all the states. That could have been possible because Apnitally has gained readership of Tally users in all the states of India. 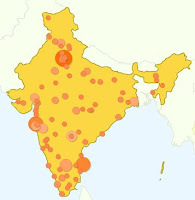 If we take a look at the stats during last month (Nov) ApniTally got almost 17000+ unique visits from 83 different cities of India out of 19000+ visits across the glob. (See map overlay of Google analytic). That's why the resume of candidates for job are also from almost all states. So if you or your organisation is looking for Tally professionals to help you out in your accounting jobs, your hunt for Tally people ends here. The process of selecting a candidate is very simple. What you have to do is just check the candidates near you from the list which is categorised according to experience of candidate, functional area of Tally (e.g. sales, support, technical,accounting), work areas, type of work (e.g. full time, part time, freelancer), age and qualification. Then fill the form based upon your selection criteria and submit the form. The rest of the things would be done by ApniTally i.e. sending him the email at his/her address with your comments about your requirements. He would respond you. Later on you can call him at his contact mobile number also. Find the right candidate now. The best part is that this service is that it is free and Apnitally is not charging a single penny for it. I invite you and your readers to contentxn.com. We look forward to working with you to make a better web. 17,000 unique visitors. Very, very impressive. http://taxvacancies.com find the top Tax accountant, tax manager position in your field. Your job is your life- dont let another day slip by with a sub-standard salary! Find tax manager jobs today at http://taxvacancies.com. With our privacy protection and selectivity, get the targeted job search you cant find from a recruiter! For the perfect customer service jobs il go to http://www.taxvacancies.com Find the best new perfect career for you when you look and fill out applications online. Dont go door to door looking for a new job. Look for one in the comfort of your own home and apply! Find the best customer service jobs in il when you sign up and search today! I think its really good ad to give the chance those who are good at tally in commerce and its a great programme to know.